Indexing creates a Table-of-Contents (TOC), which is like the TOC in a book. 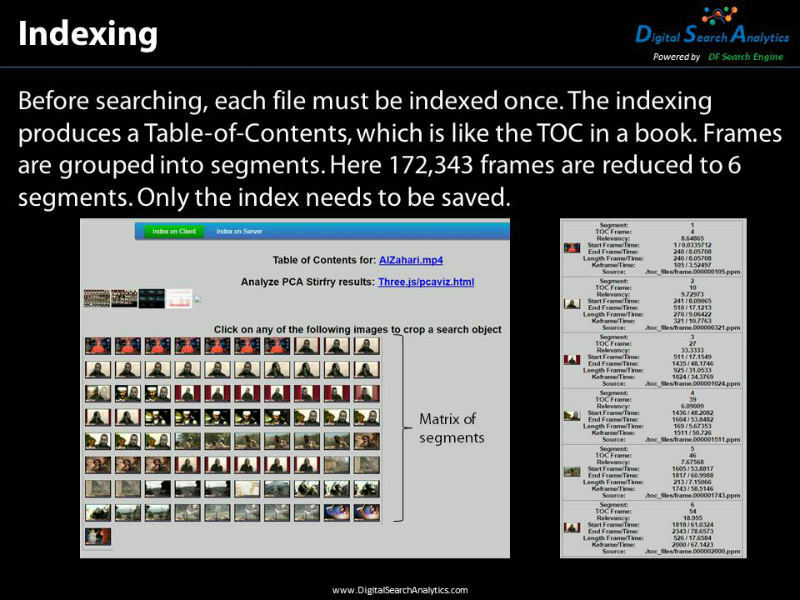 It must be done once for each file, before it can be searched with DF Search. Frames are grouped into segments. In this example 172,343 frames were reduced to 6 segments. Only the index needs to be saved. 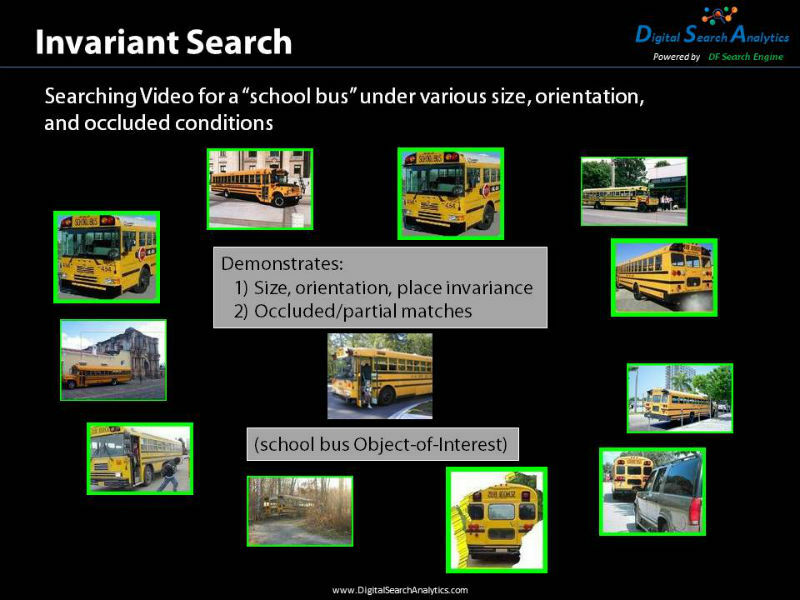 Invariant Search allows the user to search for objects that are size, orientation, and place invariant. It will find objects that are occluded or only partially visible. In this example we can find the school bus at different angles, in different locations, when it is near and far away, and when part of the school bus is hidden from view. Boolean Search allows the user to search for multiple objects conditionally, so they can create a more specific search. 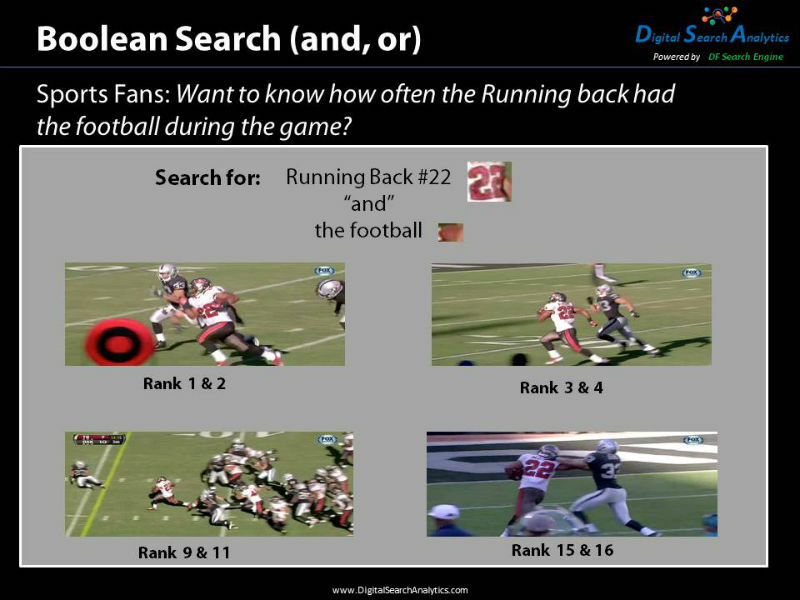 In this example they’re searching for a specific player and the football. They can find when the player has the ball, indicating an interesting moment in the game. Audio Search allows the user to take an audio clip and search for it. 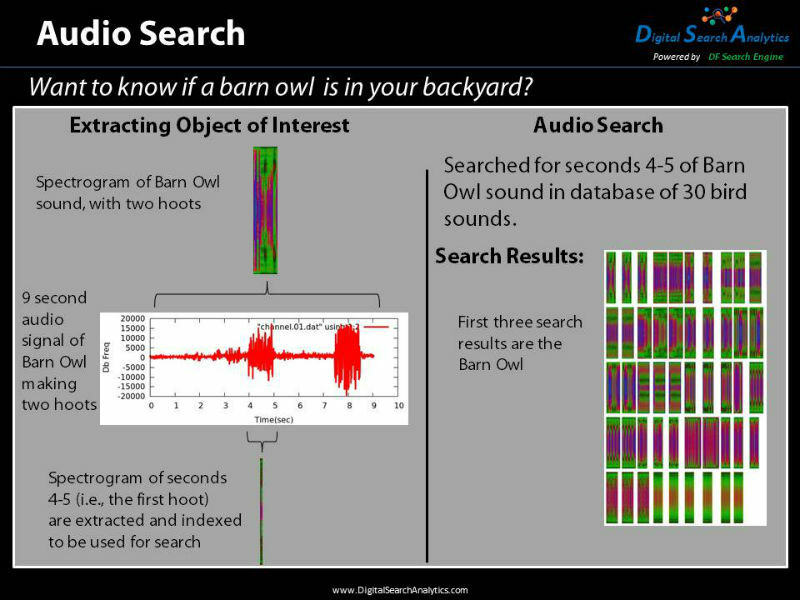 In this example the two hoots of a barn owl are searched for and found in a database of bird sounds. 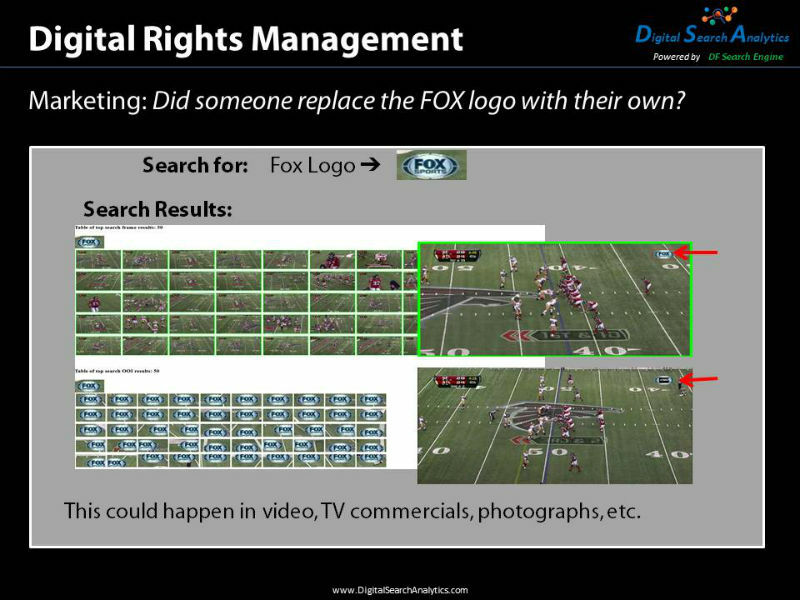 Digital Rights Management allows the user to know when their ad was shown. In this example the original ad logo was replaced with a different ad logo in part of the video. We can tell exactly when this occurred and how often. Product Marketing allows the user to know how many times their ad logo was displayed. In this example the number of times an ad logo was displayed for a series of games is shown. 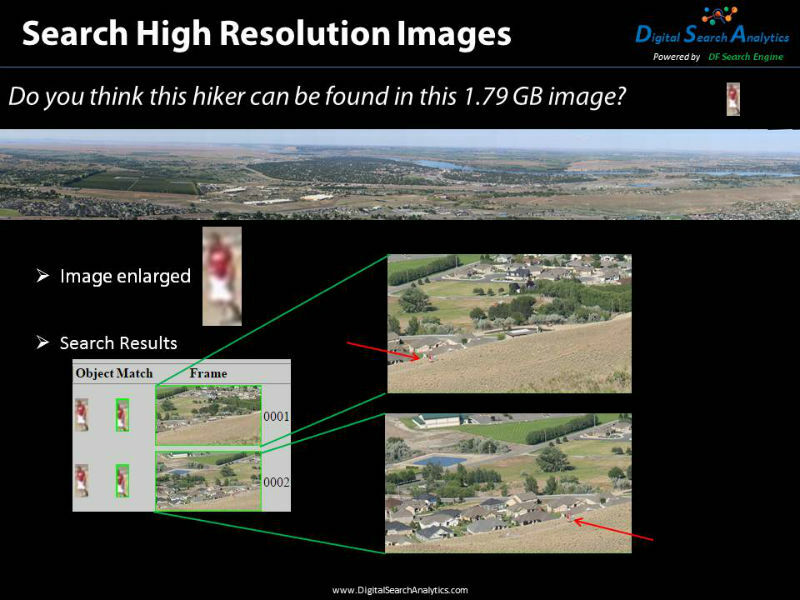 Search High Resolution Images allows the user to find a small object that is impossible to find with the naked eye in huge images. In this example a 20x40 pixel object is found in a 1.79 GB image. 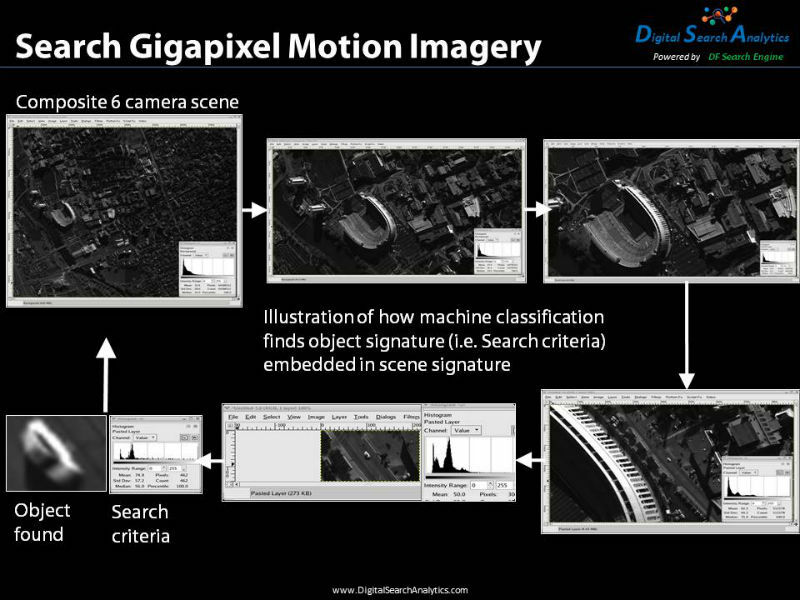 Search Gigapixel Motion Imagery allows the user to find small objects that are impossible to find with the naked eye in multiple scenes. In this example a 462 pixel object is found in several gigapixel images. 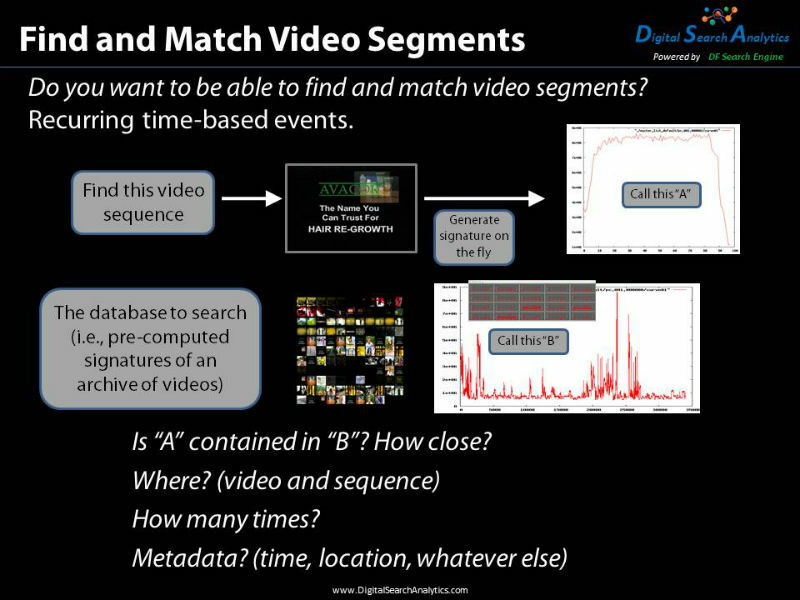 Patterns-of-Life allows the user to tell who was together and when in a video. The Boolean operators “and/or/not” can be used in the search. In this example three vehicles were found together several times, using the “and” operator. 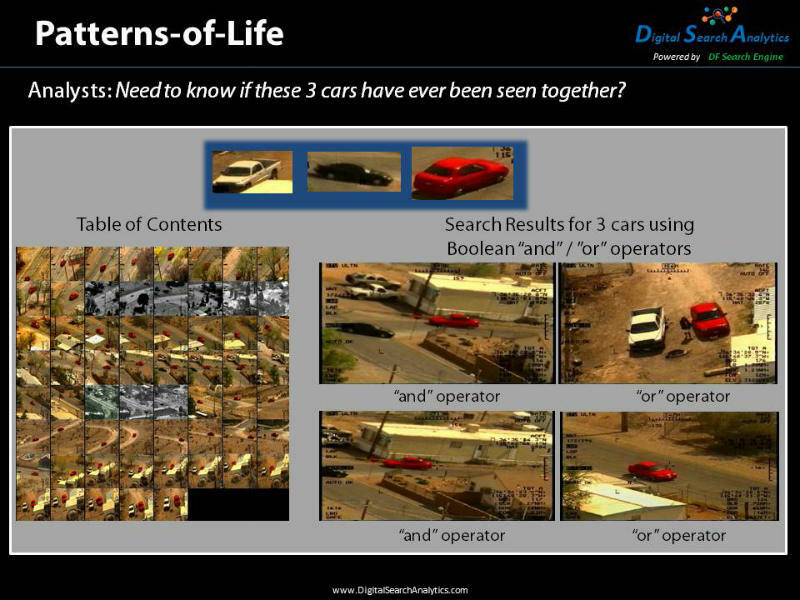 Then the “or” operator was used and the results show when any of the three vehicles were found. 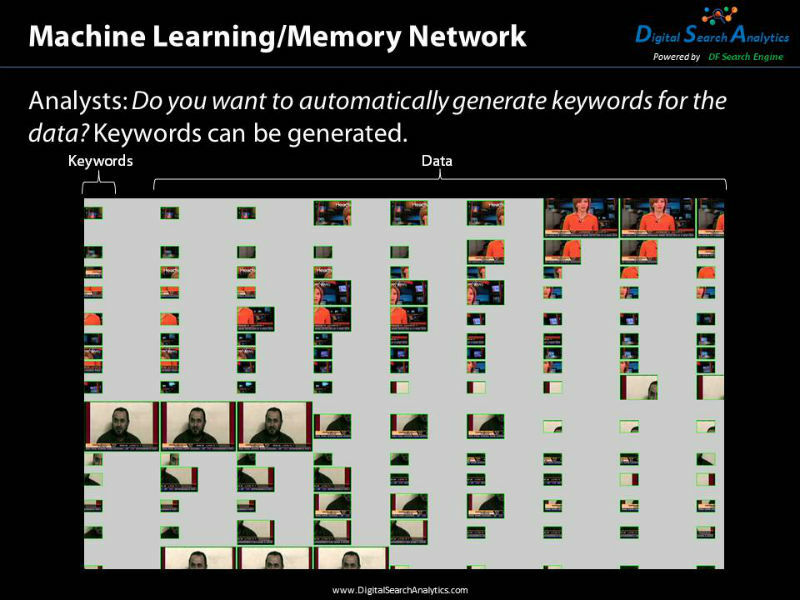 Machine Learning/Memory Network allows the user to automatically create a keyword index, thereby reducing the number of frames to search. In this example the left hand column is the keywords. To the right is the video. The keywords represent the video and can be used to search on. 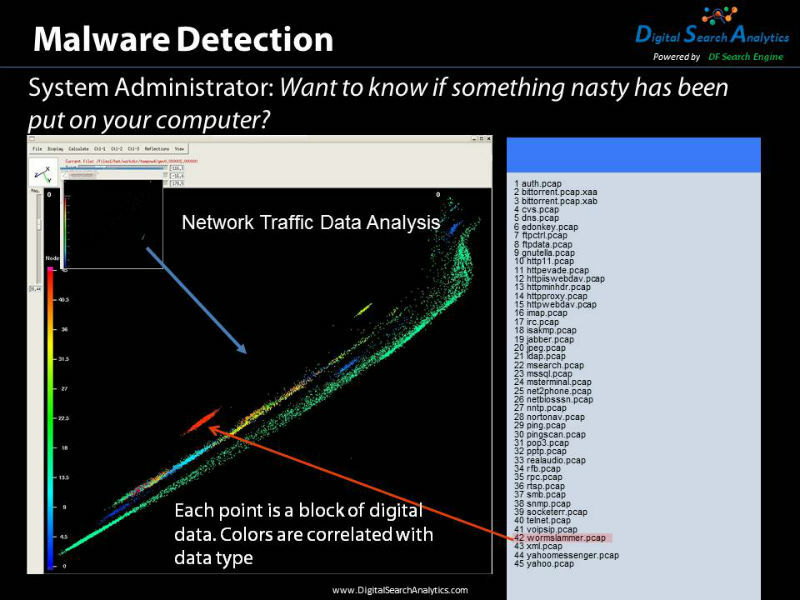 Malware Detection allows the user to visually see clustering of binary files in a 3-D image. Each point is a block of digital data and each color is correlated with a data type. In this example the red points clustered together are a malware file. Find and Match Video Segments allows the user to find video segments in videos. It will tell where found, the number of times and if any metadata was attached to it. 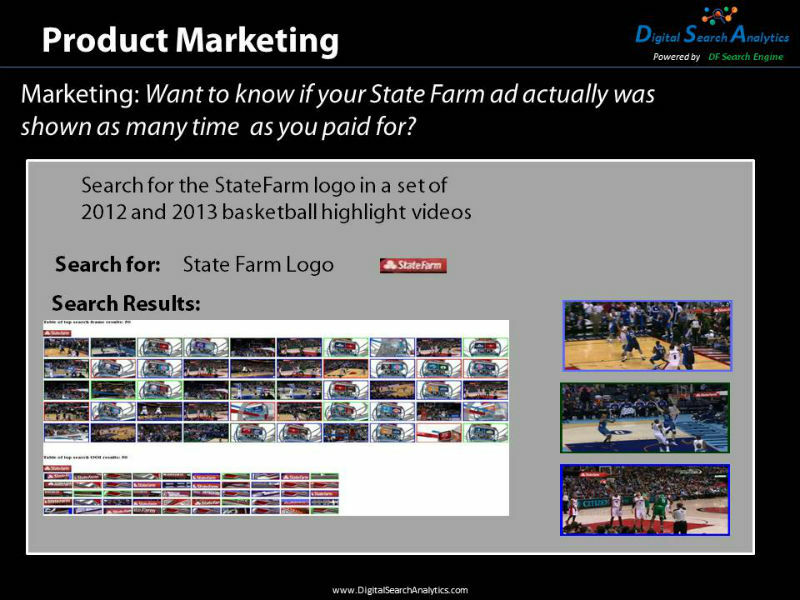 In this example an ad segment was searched for in a number of videos and found. 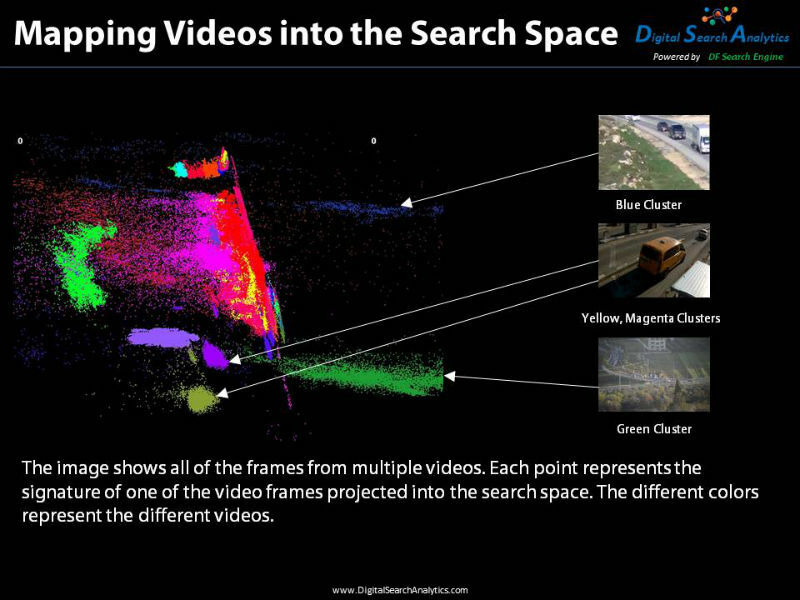 Mapping Videos to the Search Space allows the user to visually see where each frame is in a 3-D image of multiple videos. Each point represents the signature of one of the video frames projected into the search space. The different colors represent the different videos. In this example you can see a number of clusters forming from the videos. Network Modeling allows the user to visually see the differences in systems. 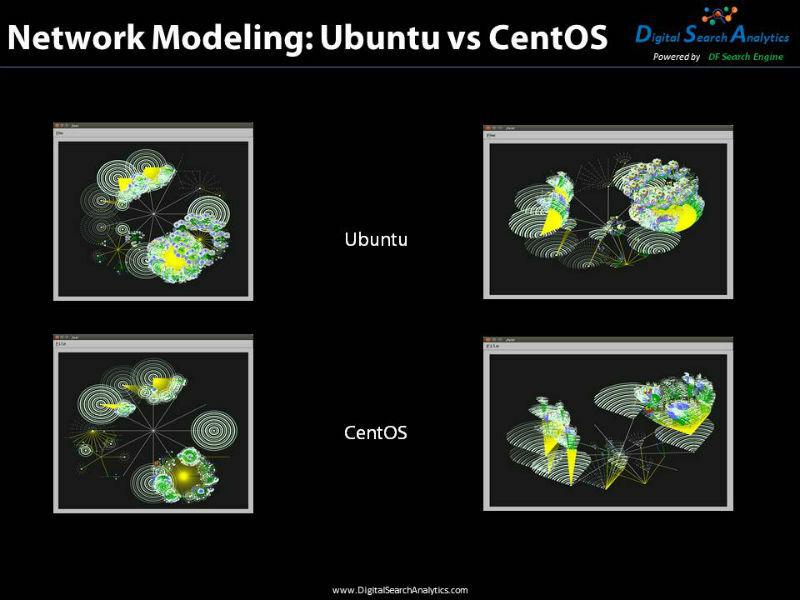 In this example a 3-D image of Ubuntu is compared with CentOS. 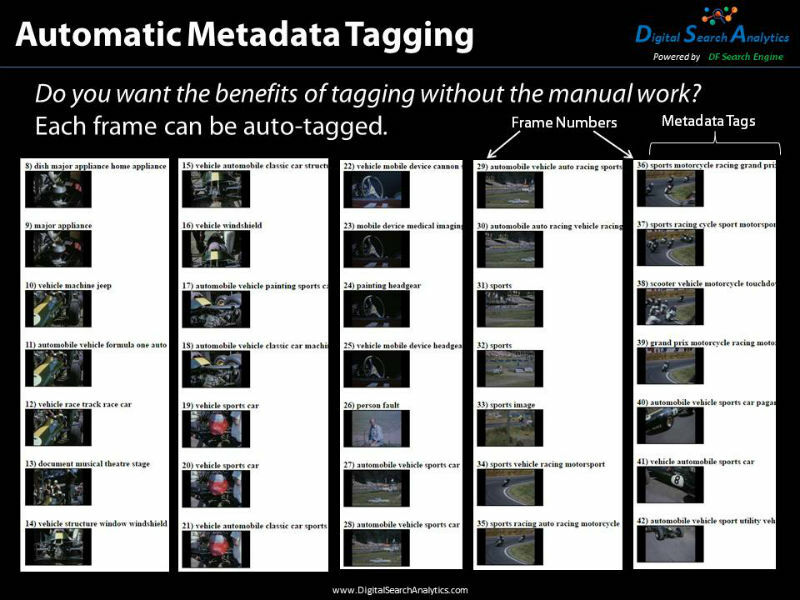 Automatic Metadata tagging allows the user to automatically tag each frame in a video. DF Search does not require tagging, but if the metadata is there, it can be used to reduce the size of the search space. In this example the video is of a sporting event and each frame has been tagged.